A conservation charity accused an American tourist of killing a much-loved Zimbabwean lion called “Cecil'' on a hunt using a bow and arrow, adding that the animal had taken 40 hours to die. The lion, which was a popular attraction among visitors to the Hwange National Park, was tempted outside the park using bait and then shot earlier this month. The Zimbabwe Conservation Task Force charity named the alleged trophy hunter as Walter Palmer from Minnesota, saying he had paid US$50,000 for the hunt. The charity said Palmer and professional hunter Theo Bronkhorst had gone hunting at night and tied a dead animal to their vehicle to lure Cecil, who was aged about 13, out of the national park. “Palmer shot Cecil with a bow and arrow but this shot didn't kill him. They tracked him down and found him 40 hours later when they shot him with a gun,'' the charity alleged. It added that the hunters then found that the dead lion was wearing a tracking collar, which they unsuccessfully tried to hide. 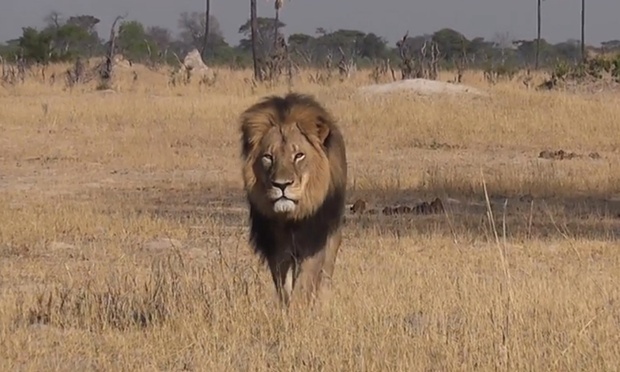 “Cecil was skinned and beheaded. We don't know the whereabouts of the head. Walter Palmer apparently paid US$50,000 for the kill and we assume Theo Bronkhorst received this money,'' the charity alleged. Bronkhorst and the local landowner Honest Ndlovu will appear in court tomorrow to face poaching charges, the Zimbabwean Parks Authority said. “Both the professional hunter and land owner had no permit or quota to justify the offtake of the lion and therefore are liable for the illegal hunt,'' it said in a statement. The statement made no mention of Palmer, but added that Bronkhorst's son Zane was also wanted for questioning. Zimbabwe Conservation Task Force said Cecil's cubs were likely to be killed by the lion that took over in the group's hierarchy. Authorities in Zimbabwe are trying track down a Spaniard who allegedly paid park guides €50,000 (£35,000) for the chance to kill Cecil, one of Africa’s most famous lions, who was the star attraction at the Hwange national park. The creature was found skinned and headless on the outskirts of the park. The 13-year-old lion was wearing a GPS collar as part of a research project that Oxford University has been running since 1999, making it possible to trace its last movements when it was tricked into leaving the park and shot with a bow and arrow. The hunters then tracked the dying animal for 40 hours before they killed it with a rifle. Bait, in the form of a freshly killed animal, was used to tempt Cecil out of the park, a technique commonly used so that hunters can “legally” kill protected lions. The Zimbabwe Professional Hunters and Guides Association admitted that its members were involved and that the case was being investigated. It claims it was a private safari and therefore not illegal, but the government insists that the lion lived on the reserve and came under its protection. The Oxford University study was looking into the impact of sports hunting on lions living in the safari area surrounding the national park. The research found that 34 of 62 tagged lions died during the study period. 24 were shot by sport hunters. Sport hunters in the safari areas surrounding the park killed 72% of tagged adult males from the study area. Dr Andrew Loveridge, one of the principal researchers on the project, said that “hunting predators on the boundaries of national parks such as Hwange causes significant disturbance and knock-on effects” such as infanticide when new males enter the prides. Police are seeking the lion’s remains among the country’s taxidermists. The Spanish conservation organisation Chelui4lions has written to Cites de España, the body that oversees the import of endangered species, asking it to prevent the importing of Cecil’s head as a trophy. “From 2007 to 2012 Spain was the country that imported the most lion trophies from South Africa. During this period it imported 450 heads, compared to 100 in Germany. Europe needs to ban these lion hunting trophies altogether,” said Luis Muñoz, a Chelui4lions spokesman. Bryan Orford, a professional wildlife guide who has worked in Hwange and filmed Cecil many times, told National Geographic that the lion was the park’s “biggest tourist attraction”. Orford calculates that with tourists from just one nearby lodge collectively paying €8,000 per day, Zimbabwe would have brought in more in just five days by having Cecil’s photograph taken rather than being shot by someone paying a one-off fee of €50,000. The incident, which occurred earlier this month and has only just come to light, has caused outrage in Zimbabwe, coming only days after the ZCTF revealed that 23 elephant calves had been separated from their herds in Hwange and exported to zoos in China and the United Arab Emirates. The Zimbabwean government insists the trade is legal and measures are in place to guarantee the animals’ wellbeing. This article was amended on Sunday 26 July. An earlier version said Cecil had been wearing a GPS collar since 1999. It should have said that the GPS project has been running since 1999. A reference to elephant cubs has also been corrected to calves.